Desert Academy, Santa Fe, USA "CACHEBOX alleviates bandwidth-intensive content from our network - gives us the connectivity we need..."
Mark Nwangang, Oprah Winfrey Leadership Academy for Girls, South Africa "We were impressed with ApplianSys’ dedicated support team. They are very professional and have helped us get the most out of CACHEBOX deployments for our clients." The Calgary Science School (CSS) is a Canadian public charter school in Calgary, Alberta; which teaches grades four through to nine. The school’s network supports the IT and web requirements of over 600 students and teachers. CSS maintains a 1:1 student to computer ratio; all students are given their own laptop computers to use as a learning tool both in class and at home. More recently, since receiving a governmental ‘Emerging Technologies’ grant, CSS has been issuing new students with Apple IPads. The school’s network uses a 20Mbps internet connection to serve 600 + devices. Bandwidth usage ranges from light general browsing, email and document sharing to downloading video and other large object files such as software updates. The problem was that internet speeds during lessons were becoming very slow, impacting the productivity of students and teachers. 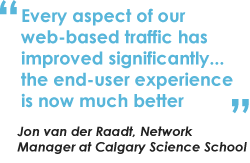 Calgary Science School sought a caching solution that would alleviate the bandwidth strain by effectively caching the content that was creating the most problems. Having looked at multiple solutions online, the school decided to purchase a CACHEBOX230. CACHEBOX’s ability to handle video content and software updates was particularly attractive. “We went with CACHEBOX for a number of reasons: the people at Appliansys understand the needs of those working in education, the solution offers high performance for a reasonable price and is backed by quality service,” explains Jon. In the past, Calgary Science School struggled with software updates. CACHEBOX’s inbuilt pre-caching functionality allows these updates to be fetched overnight when traffic is low. This means that updates no-longer slow down internet access for other users during peak traffic times. Calgary Science School will also benefit from CACHEBOX’s ability to effectively handle large content such as video. “Video sharing sites like YouTube deliver flash videos over HTTP. This service consumes large quantities of bandwidth, and slows things down for users. Although caching is the obvious solution, many ‘unintelligent caches’ run into problems. Video sharing websites store the same content at multiple URLs. This confuses many caching solutions into treating each URL as unique content. In addition, websites like YouTube often change the rules for presenting their content so that caching no longer works. At Appliansys we constantly monitor these changes and re-engineer our solutions to cope with them.” comments Nick. Since deploying CACHEBOX, CSS has benefited from significant performance improvements and bandwidth savings. CACHEBOX has enabled the school to use internet based content during lessons, delivering a better learning experience for students. In particular, teachers are now able to use video content from various websites without worrying about classroom delays. CACHEBOX has delivered average daily bandwidth savings of around 42% and generated a speed increase of up to 66% at peak times. There have also been dramatic improvements in bandwidth savings associated with updating software for all active devices throughout the school. Updates from software vendors such as Apple and Microsoft are now only downloaded the first time they are requested. They can then be served from cache for subsequent requests.